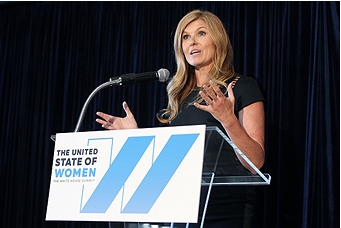 A White House-convened event organized by non-profit organization Civic Nation, the United State of Women Summit brought together more than 5000 women from across the country for a day of discussion on a wide range of topics incuding economic empowerment, health and wellness, violence against women, entrepreneurship and innovation, and leadership and civic engagement. The evening prior to the Summit, Rendezvous joined Civic Nation in producing a small VIP fundraising reception for just over 100 guests at the Hay Adams Hotel. As anyone familiar with the Top of the Hay knows, there’s not much to be done to ‘beautify’ the venue, with its breathtaking 360° views of the White House and National Mall. But it was important to event hosts that the evening experience was VIP from start to finish, and that Summit branding and messaging had a strong presence throughout the event. With just a few short weeks to bring this uber-VIP experience together, we worked closely with our hotel hosts to select food, beverage, furniture and décor options that spoke directly to a “white glove experience” within a limited budget. A custom built floor to ceiling step and repeat wall blended seamlessly into the venue, incorporating Summit and sponsor branding and immediately becoming a focal point for the guest experience at the event. Additional event backdrop and staging elements were designed to match the overall Summit style, contributing an overall look and feel that was simple, clean, elegant and inviting. 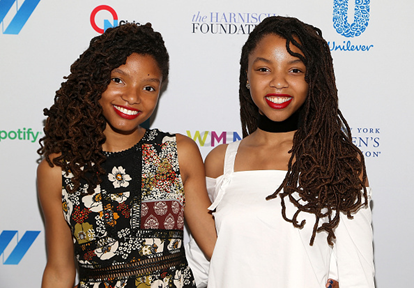 Chloe and Halle Bailey at the photo wall.